Coprosma Rainbow Surprise is a small finely textured dense shrub. The Rainbow Surprise Mirror plant will grow to 4 feet tall and wide. Coprosma Rainbow Surprise prefers regular water but will get by with far less once established. Plant in full sun to light shade, more shade the further inland the garden. 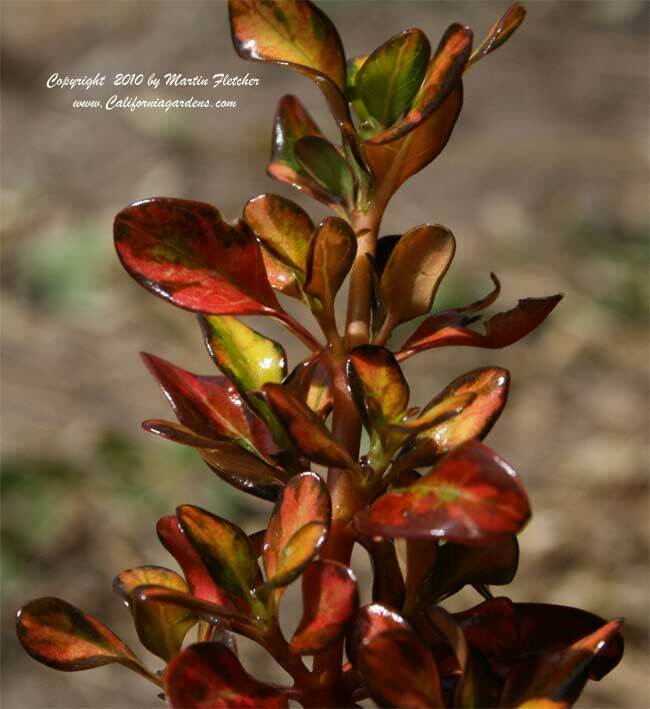 Coprosma Rainbow Surprise will change color with the season, increasingly becoming red as the weather cools. Coprosma Rainbow Surprise is grown for its colorful foliage. The Rainbow Surprise Mirror plant produces small white flowers Spring into Summer. Plants are hardy into the low 20°'s F.
Flowers and foliage of Coprosma Rainbow Surprise The Rainbow Surprise Mirror Plant. High resolution photos are part of our garden image collection.